September | 2013 | Sweet Cats! The past couple of weeks have been super busy. Between school, meetings, Aggie football, and other weekend shenanigans, I’ve been neglecting Sweet Cats! a bit…sorry! I have so many ideas, but so little time to blog! One of the things that has been eating my time is cooking dinner. Don’t get me wrong, I love cooking for myself, but it can definitely be a challenge to not only come up with meals for just one person, but to also come up with recipes using what I have on hand! One of my current favorite meals is salmon. I recently came across a package of frozen salmon with 4 pieces for $10- a steal when it comes to salmon! I snatched it up, excited to see how many different recipes I could try. Tonight, I made a very simple recipe from my culinary hero, Ree Drummond the Pioneer Woman. You can find her recipe here, but I altered it a bit, so I’ll go ahead and share what I did. First, brush 1 tbsp of olive oil onto one side of the salmon. Sprinkle liberally with salt, black pepper, and dill weed. -Place the pan in a cold oven, and then turn to 400 degrees. -Cook for 25 minutes, or until salmon is flaky and opaque. That’s it! It doesn’t get any more simple than that, ladies and gents. I really like this, because it is so simple. The salt and pepper give it a bit of flavor without overpowering the salmon itself, and the dill adds a little variety. SO. GOOD. -Bring a giant pot of water to a boil. It doesn’t matter how much, as long as all your spears will fit inside and be completely submerged. -Once boiling, drop in your asparagus and let boil for 2-3 minutes. -Remove asparagus from boiling water and immediately transfer to a bowl filled with ice water. This will cool the asparagus while preserving its bright green color. I serve mine with a “dipping sauce” of Greek yogurt mixed with brown mustard, and I eat it with my fingers. Julia Child says this is perfectly acceptable. 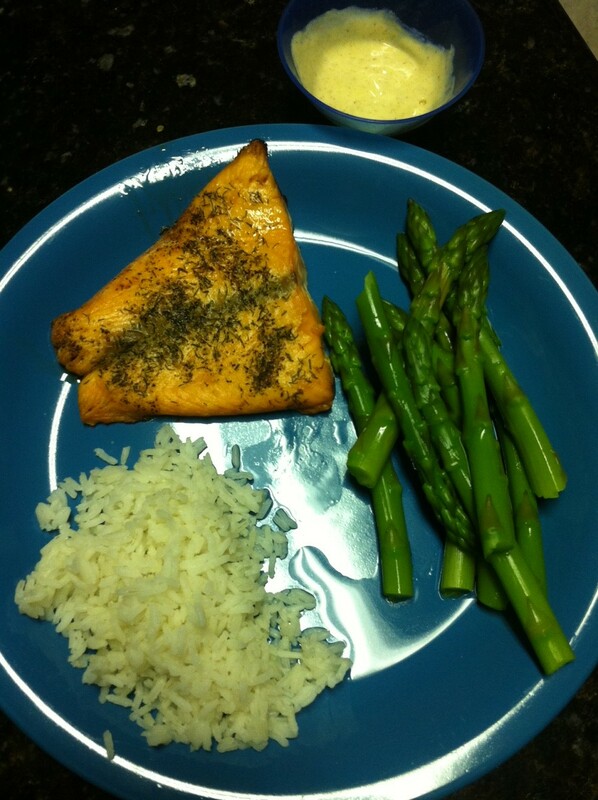 So there you have it- a very simple and very healthy weeknight meal! It’s no secret that I love jewelry. From necklaces, to earrings, to bracelets, baubles are the best, and the bigger the better in my book. However, since I’m usually wearing Norts and a tee now every day now that I’m at school, statement necklaces and dangly earrings look a little out of place. 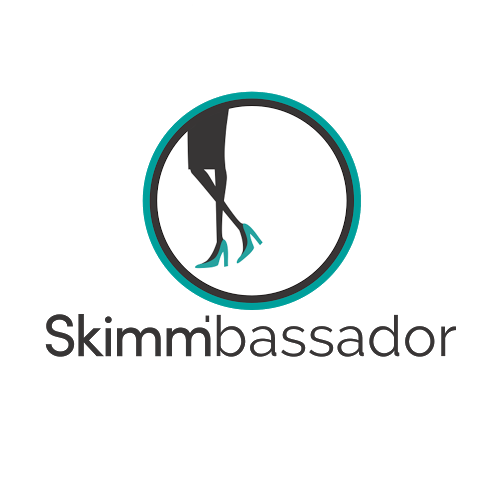 But I still like my outfit to have a bit of sparkle, so I’ve got a few staple pieces to wear everyday that draw attention, but not too much! 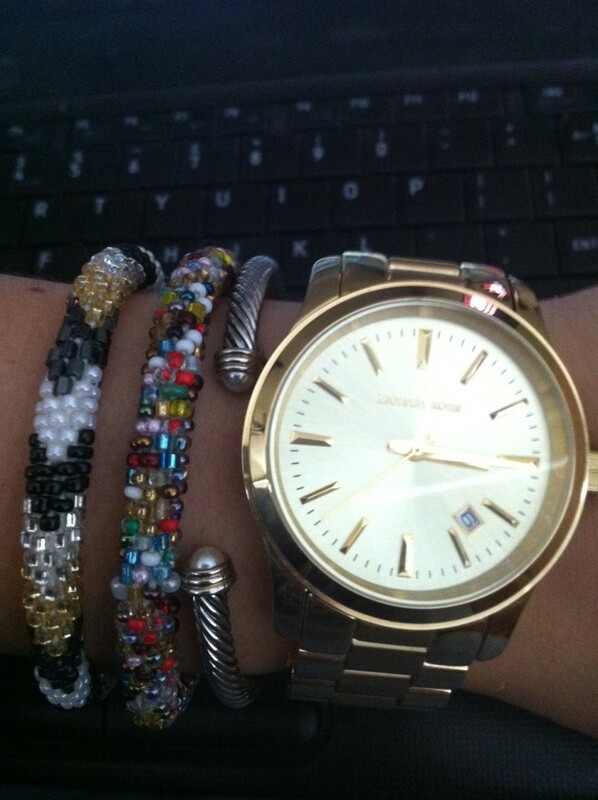 First, I start with a stacked wrist. I start with one or two Lily and Laura bracelets, then add my cable bracelet from Katie’s, and anchor it with my Michael Kors watch. I feel like I can get away with this arrangement at school because the watch is practical, and the other pieces are fairly small and not too fussy, so it’s still cute, but fairly casual. Next, I wear my James Avery rings that I’ve worn forever: one on each hand. However, soon I will replace the one on my right hand with my Aggie Ring! WHOOP! 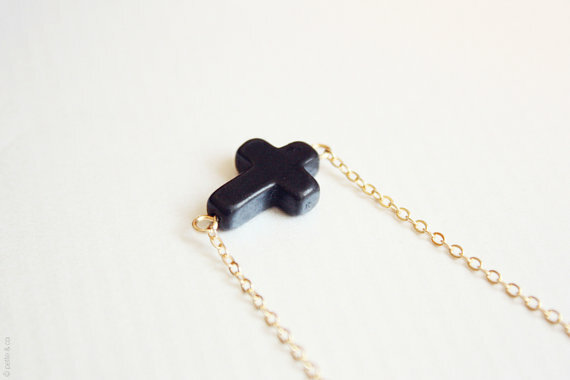 As far as necklaces, I usually wear my delicate, black sideways cross necklace. Although it’s very trendy, I like to wear it because it goes with everything, and because it’s a great reminder throughout the day! For earrings, I tend to wear studs. 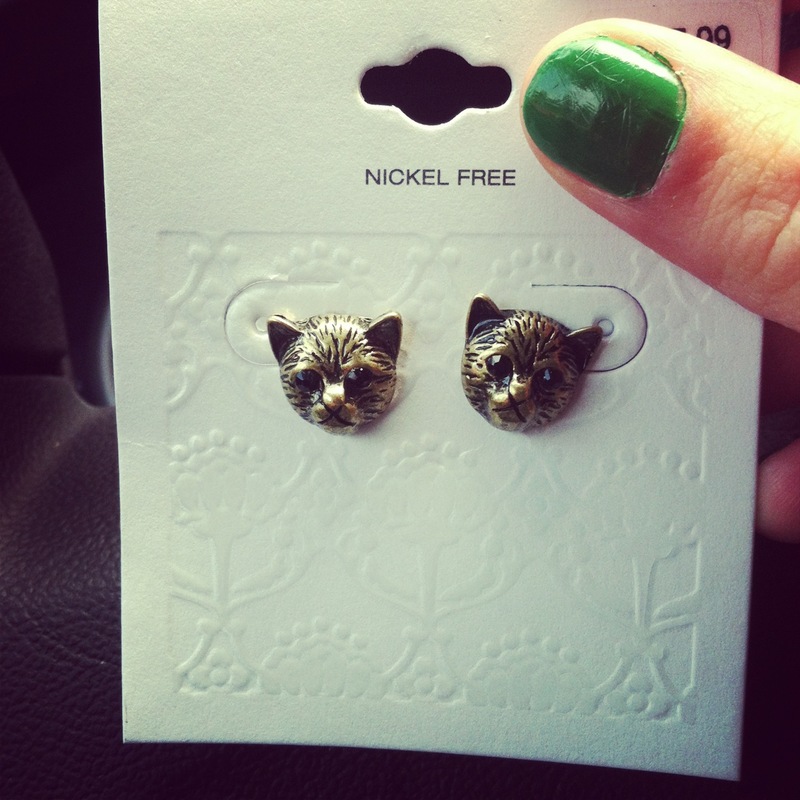 My current favorites are these kitten earrings from Target, but I also wear my pearls, my Kendra Scott Morgan Studs, or any other shape and size of studs. This might seem like a lot of jewelry for some, but for those of us who love our gems, it’s just enough! What is included in your everyday jewelry? Every Thursday, I have four classes back-to-back, and it takes me at least 15 minutes to get to each one! My day starts at 8 am, and goes nonstop until 3:30. I bring a few snacks to get me through the day, but I’m always so hungry when I get home! This Thursday, I decided to use some leftover fresh mozzarella I had from when I made The Pioneer Woman’s Thai Chicken Pizza. I was also inspired by my roommate Kadie’s delicious Caprese pizza she made Wednesday night! First, cut a few thin slices of mozzarella, and break into pieces over the tortilla. Next, microwave for one minute, until the cheese is melted. 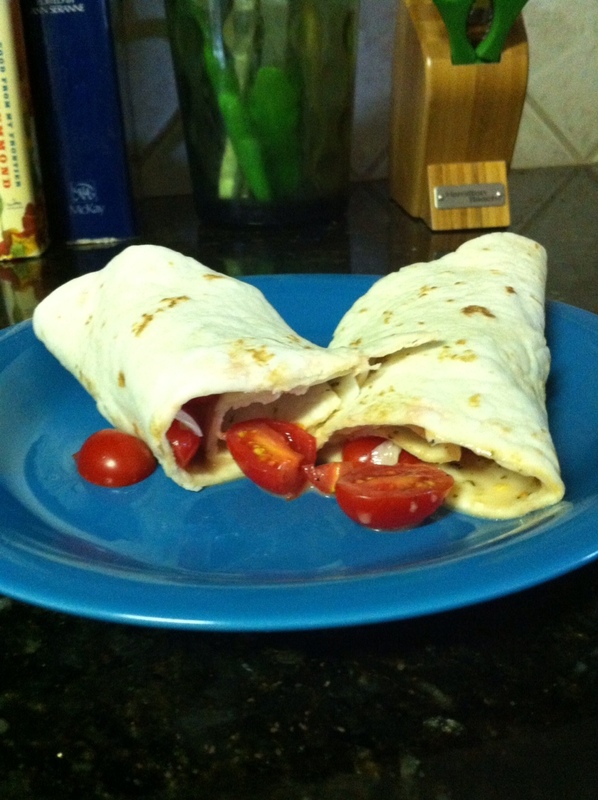 While the tortilla is in the microwave, slice 6-8 cherry tomatoes in half. Remove tortilla from microwave and arrange tomato halves in the center. Sprinkle Italian seasoning over the top of everything. My roomie Trina has this fabulous Italian seasoning grinder that I used, and I would definitely recommend it! Finally, roll it up and enjoy! This is great for a quick and easy lunch or snack, and it’s (fairly) healthy! Enjoy! One of my favorite parts of Fall is football season. I was a cheerleader from seventh grade to twelfth grade, so Thursday & Friday nights meant performing, which I absolutely loved. Once I got to college, it was a foreign concept to me to just sit in the stands and watch the game, but I love it all the same! At least once per game, I’ll have a chant pop into my head from my cheer days- for example, when the Aggies are having a hard time holding the offense, I’ll automatically think, “Sack that quarterback, defense ATTACK.” But don’t worry, I keep these things to myself. Ever since Texas A&M entered the SEC, our gameday attire has drastically shifted from ultra-casual to ultra-chic, which I love! I had planned on sharing my gameday outfit from this past week, but it was 106 degrees at the game, so in the few photos I have, I’m sweating death and it’s not cute. Maybe next week! However, such extreme conditions did get me thinking about what every girl should have handy on gameday. Over the past two football seasons, I’ve perfected the gameday bag and its necessary contents. Here you go! 1) Water- I’m not trying to be your mom or anything, but this is very important. Especially in Texas, the first few games are extremely hot, and you will want plenty of H2O, to stay hydrated! I would suggest taking two, and freezing one beforehand. No, it’s not the cutest accessory, but passing out isn’t the best way to spend half time, now is it? 2)Sunscreen-again, not trying to be your mom, but this is also very important. Only for day games, obviously. But really, I can’t tell you how many awkward sunburns I’ve seen after game weekends- I once got one on only one half of my face. Prevent this (and melanoma) with a liberal application of sunscreen on (at least) your face. 3)Crossbody bag- you want something that holds everything, but not something too heavy. You also want the option of being able to hold it throughout the game if you need to, if, for example, someone spills a drink in the stands, or it starts raining (heaven forbid) and you don’t want to place it on the ground. 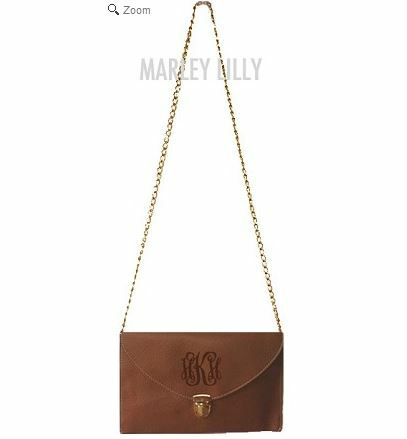 Of course there are many options, but my absolute favorite is the monogrammed crossbody from Marley Lilly. There are so many color options that coordinate with many different gameday color schemes. Unfortunately, there’s no maroon, but I love the brown, black, and cream options! I don’t have one yet, but it’s definitely on my “to-buy” list! 4) Sunglasses- Pick a pair that looks good on your face shape and matches your outfit- black and brown are always wonderful options, and aviators go with literally everything. Throw them on when the sun is in your eyes (obvi. ), or when you’re trying to hide the fact that it’s too hot and you were ready to leave last quarter. 5) Lipstick and lip balm- For some reason, one of the only places I wear bold lipstick is to football games. I guess that’s just the Southern belle in me! If you wear lipstick, tuck the tube inside your bag for touchups, in addition to a tube of lip balm. Something about being outside makes me feel like I need it, so I like to have it on hand! 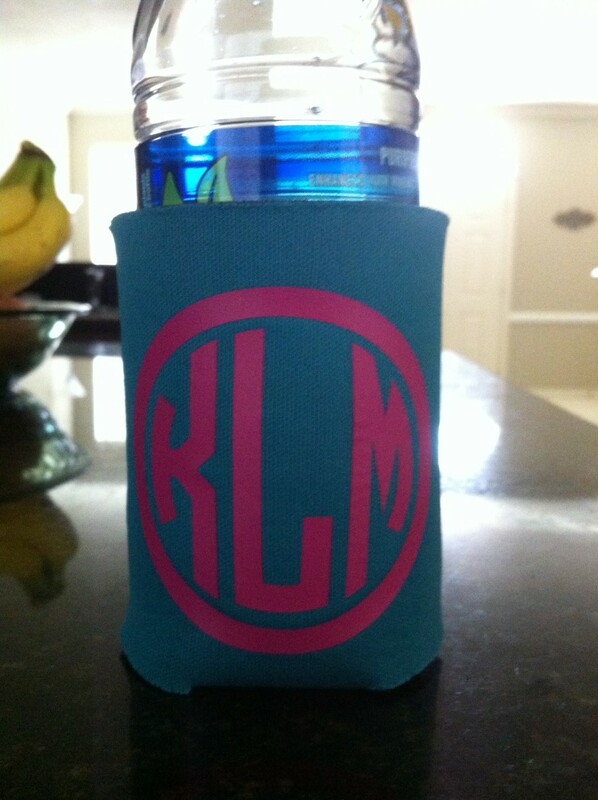 6) Monogrammed Koozie- or not monogrammed, your choice. This is great for tailgating and all that WATER you’ll be drinking. I loathe carrying water bottles that are dripping with condensation, so this is a great solution for that problem! You can also always tell which drink is yours. My roommate got me this little cutie for my 21st, and I forgot it last week, but I’m looking forward to using it this week! I’m not sure where she got it, and she’s not home for me to ask, so if you’re looking to add this to your gameday stash, check out Marley Lilly! 7)Game tickets- don’t leave these at home- that’s always a tragedy. 8)Raincoat- if you think it might rain, bring one! Most stadiums don’t allow umbrellas inside, so you don’t want to be a soaking wet kitten in your cutie gameday outfit! ALWAYS check the forecast before you go! Hopefully this will help you get prepared for gameday this weekend! Writing this has gotten me all excited for Saturday in Kyle Field! What are your gameday essentials? I know it’s been a while since I’ve posted, but I have been SO BUSY. Between getting my house situated, catching up with friends, going to school, and my friend from high school visiting, I haven’t had time to clean my room, much less blog! That being said, this semester coming up looks like it’s going to be a busy one, so Sweet Cats! (unfortunately) might not get all the attention I would like to give it over the next couple of months. However, I will try to post at least once a week! With fall approaching quickly, we’re all looking for those transition trends, that still feel like summer, but don’t look out of place for fall. One of my favorite transition trends is turquoise jewelry. Turquoise has been a great accent to the bright colors of summer sundresses, and it works well with darker, fall colors, such as black, mustard, and maroon. Here are a few of my favorite turquoise baubles I’ve been wearing this summer, and have been eyeing for fall! 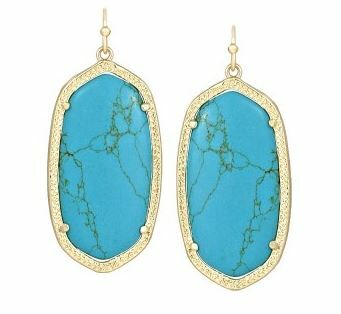 First, I have Kendra Scott’s Elle earrings in turquoise. You’ve seen these (and will continue to see them) all over my outfit posts. I like these because they’re big enough to be a statement, but not too big to where they overwhelm your face! These earrings will add a pop of brightness to your fall ensemble. 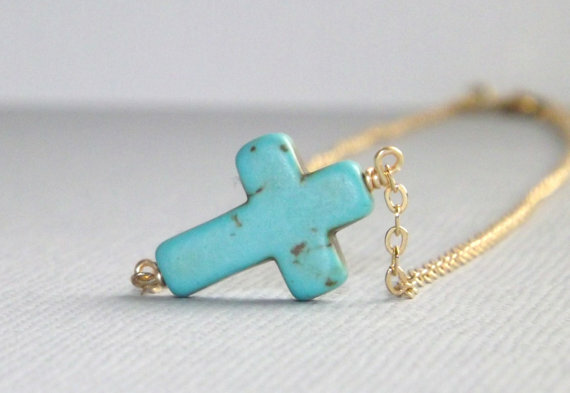 Next, I have this turquoise sideways cross necklace from Pink Twig on Etsy. I have loved these dainty little pieces ever since I first saw one! I recently purchased a black one, which I love, but I’m also still on the lookout for a turquoise one! This necklace is the perfect addition to any outfit, it’s simple and dainty, but still very cute! I also read somewhere that the sideways cross is a symbol to “take up your cross and follow Jesus”, which I think is a wonderful thing to be reminded of! 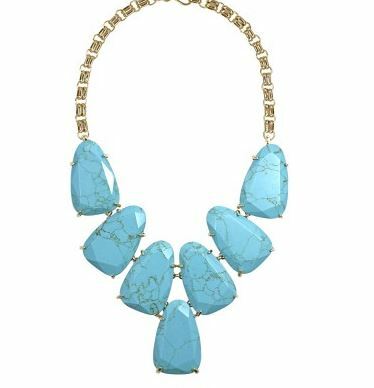 In case subtle isn’t really your thing, (sometimes it’s not mine, either) the Kendra Scott Harlow necklace is a bold way to wear turquoise. You can pair this with a summer maxi one last time, or with a solid tee and cardigan! These are just a few options for this transitional trend! What’s your favorite turquoise piece, and how do you wear it?